Let’s talk about conference rooms- what are the most memorable conference rooms you’ve seen? What made them pop? Some of the greatest, most crucial ideas are often conceived, debated and put into action all within a conference room. The ambient needs to be optimal for communication to flow. The best architectural insights are often needed to create such an atmosphere – insights that we capitalize on when designing conference rooms for our clients. 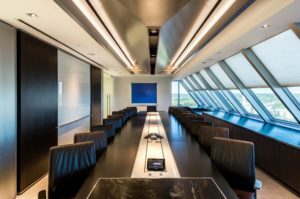 Above is a Master Conference Room we created for a major insurance company. For this project the client requested a very high end look insisting on the highest quality materials and finishes. The requests were perfect considering the high level of work that takes place in the conference room. Where does the most important person in the room sit? That’s right, at the end of the table in between both rows – so we complemented the end with a marble finish. The lighting allows for maximum visibility encouraging activity and a feeling of energy within the room. Check out some of the other conference rooms we have designed below, such as the one we designed for the headquarters of Esquire Bank – a bank that specializes in dealing with attorneys and the legal industry. The artwork shown depicts the New York State Supreme Court room – dating back to the 1800’s, which is where all new attorneys who passed the BAR Exam were sworn in. The goal is to try to predict how the clients will feel when they sit in this conference room.